Last weekend, thousands of Republicans young and old flocked to National Harbor, MD for the largest conservative gathering of the year: the Conservative Political Action Conference (CPAC). 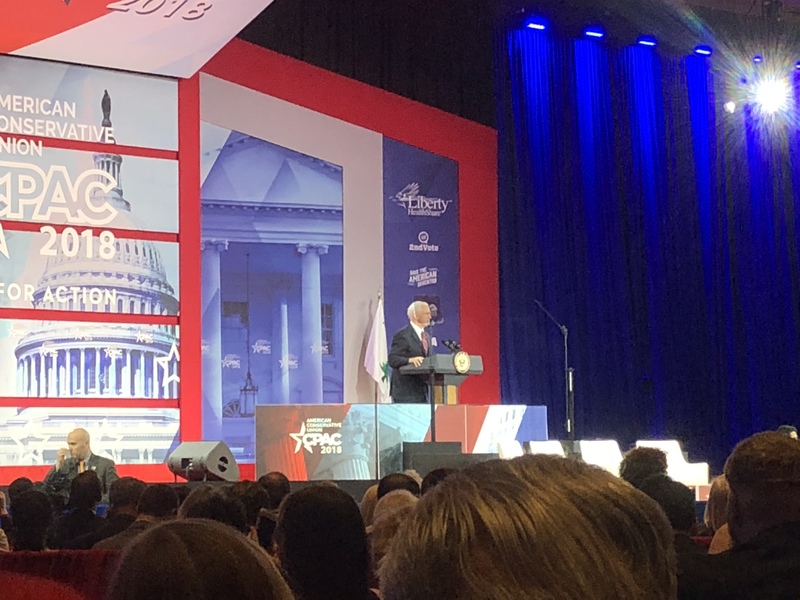 The laundry list of speakers in attendance included sitting senators, members of congress, political pundits, journalists, activists, and of course our very own President Trump and Vice President Pence. For many starry-eyed young conservatives like myself, CPAC is a place like no else. Yet this year some of the speakers invited came to the shock and dismay of many, such as Marion Marechal-Le Pen, a French politician whose grandfather founded the French far right National Front party. Marion is also the niece of current National Front leader and failed French presidential candidate Marine Le Pen. CPAC is not immune to controversy, as last year the American Conservative Union canceled an appearance by Milo Yiannopoulos after the right-wing provocateur made comments that appeared to defend pedophilia. This year, everything had a Trump tinge. Panels had titles such as “#TrumpedUp: Unmasking the Deep State” and a conversation on immigration and the fate of the Deferred Action for Childhood Arrivals (DACA) titled “You May Say You’re a DREAMer But You’re Not the Only One.” The mainstream media, fairly or unfairly, was quick to label CPAC as TPAC (the T of course referring to President Trump). The media’s credibility took another hit, and don’t expect them to win over Republican voters anytime soon. Luckily, The Review was never called out. As President Trump famously said on the campaign trail, “We’re going to win so much, you’re going to be so sick and tired of winning.” Yet, not everyone was a winner over the weekend. Some voices in the conservative movement were obviously missing from the annual conference, as it was clear from the get-go that the populists were in charge. Here are the winners and losers of #CPAC2018. Tea Party: If it weren’t for many attendees donning iconic yellow “Don’t Tread on Me” paraphernalia, you might have forgotten that the Tea Party still exists. Sure, Tea Party leaders Mark Meadows, Jim Jordan, and Ted Cruz all took the stage, but they were certainly overshadowed by the populist, anti-immigration, protectionist wave of the party. The Tea Party movement became so influential in 2010 because it was an impassioned reaction against the expanding role of government during the Obama years. Now that President Trump is in office, and Republicans are thrilled with his surprisingly conservative policies, the Tea Party seems unneeded. Republicans are no longer angry, as their man is in the White House. Traditional Reagan Republicans: It is remarkable how conservative Trump has turned out to be, from tax cuts, deregulation, increased funding for the military, to the elimination of the Paris Accord and individual mandate. If you’re a conservative, what is there to complain about? Yet, this year’s CPAC made it abundantly clear that the Republican Party belongs to the populists. The intellectual ideas of William F. Buckley, Irving Kristol, and Russell Kirk have been thrown aside for Sebastian Gorka’s fear mongering, Sheriff David Clarke’s demagoguery, and Kirk’s (Charlie not Russell—huge difference) narcissism. A particularly striking story comes from Ethics and Public Policy Center fellow Mona Charen. Charen dared to criticize Trump’s behavior towards women and the GOP’s decision to back an accused child molester in Roy Moore only to be booed and then hustled out of the building by security guards. Another incident occurred when a CPAC spokesman said Michael Steele was chosen to lead the GOP because he is a “black guy.” Those in attendance at the Ronald Reagan dinner rightfully gasped. Traditional republicans ought to be outraged. Media: Perhaps, the disconnect between the mainstream media and Republicans has never been more evident than at CPAC 2018. It seemed that every panel bashed the always-loathed mainstream media that has been caught on numerous occasions peddling anti-Trump stories that turned out to be false, such as when ABC’s Brian Ross incorrectly claimed that Michael Flynn would testify that Trump had ordered him to make contact with Russians about foreign policy, leading to calls for Trump’s impeachment. The media’s credibility took another hit, and don’t expect them to win over Republican voters anytime soon. Luckily, The Review was never called out. NRA: Just over a week after one of the worst shootings in U.S. history at the Stoneman Douglas High School in Parkland, Florida, the embattled National Rifle Association opened the conference with a vigorous defense of the Second Amendment. NRA chief Wayne LaPierre had the perfect platform to defend the NRA’s work and reiterated calls for increased security in schools. He concluded with the often repeated battlecry, “The only way to stop a bad guy with a gun is a good guy with a gun.” Next up was the fearless and brazen NRA spokeswoman Dana Loesch who was fresh off of her appearance on CNN’s gun control town hall. In a scathing speech, Loesch attacked the media and blasted the FBI for not arresting the Parkland shooter sooner. The NRA left CPAC with members reinvigorated and even had a line of new members eager to sign up. With the always unpredictable Trump in office, no one could properly predict what is in store for next year’s conference. Though it seems likely that traditional Republicans have a long way to go if we want to retake control of the party of Reagan.